Part 1: Tell whether the dotted lines on the shapes are lines of symmetry. 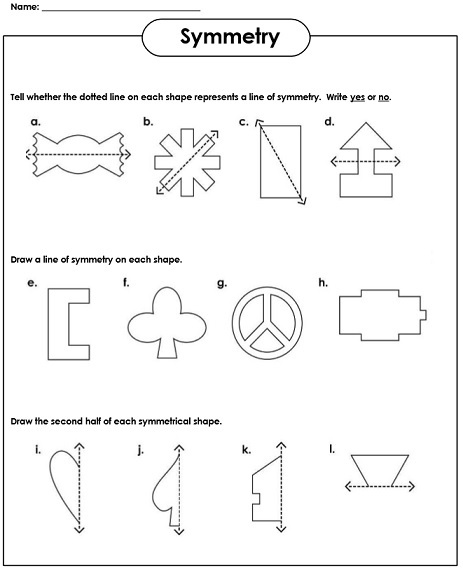 Part 2: draw lines of symmetry on the shapes.Part 3: draw the second half of each symmetrical figure. Draw a line of symmetry on each shape. Draw the missing half of each symmetrical shape on the dotted graph paper. Cut out these 12 large shapes and fold them on their lines of symmetry. Determine whether the dotted line on each of the shapes is a line of symmetry. 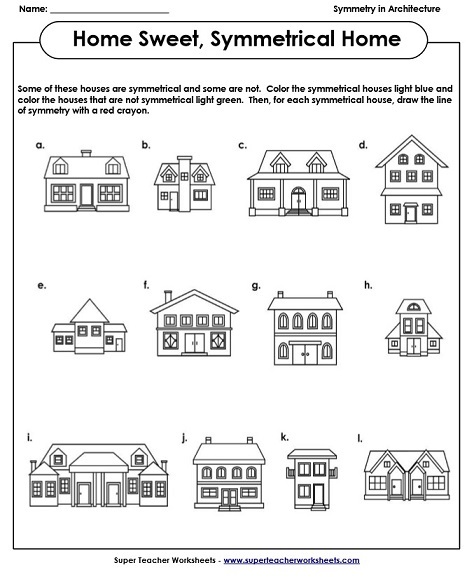 Tell which of these houses are symmetrical and which ones aren't. This file contains 20 symmetry task cards. Use them for small group instruction, learning centers, exit tickets, or classroom games. Try to sketch four different symmetrical objects - a snowman, an alien, a sailboat, and a friend. Use a red pen to draw the line of symmetry on each of your pictures. 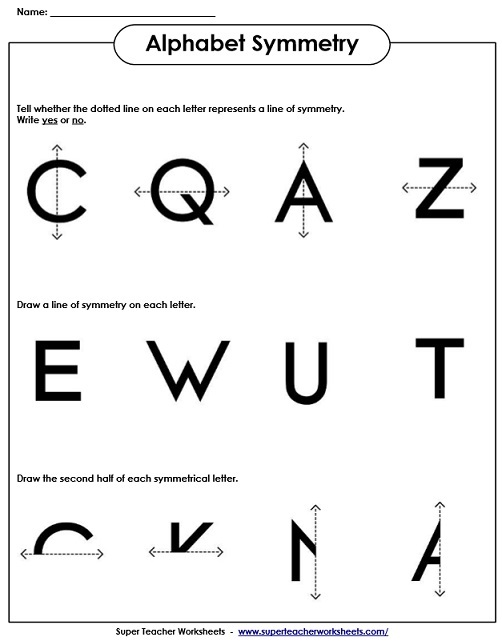 Draw lines of symmetry of the capital letters. Draw the second half of the symmetrical letters. Color the pattern so that it makes a symmetrical design. Examine the folded pictures and tell which shape you'll see when the paper is unfolded. Add the lengths of the sides to find the perimeter of these symmetrical polygons. Requires advanced multiplication. Learn about lines, angles, polygons, solid shapes, circles, and more! Practice reading clocks and telling time. Round numbers to the nearest ten, hundred, and thousand.